The Libraries are once again teaming up with the Writing Center to offer a series of Crunch Time Clinics. Work with a Temple University librarian and a Writing Center tutor for help identifying sources, searching databases, refining thesis statements, evaluating content, creating citations, and more! Need dedicated time and space to write? 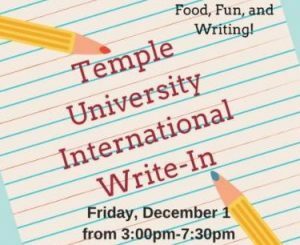 The Temple University Writing Center and Temple University Libraries invite you to our first campus International Write-In! Join us for an afternoon where we gather together as a community to write together, and to celebrate writing on our campus. With your fellow Owls, work individually or in small groups, and write for your academic programs or creative projects in three dedicated writing spaces. All members of the Temple community are welcome. A librarian and Writing Center tutors will be available to help students with writing and research questions. Advanced registration required for some spaces. Snacks, refreshments, and writing supplies provided. 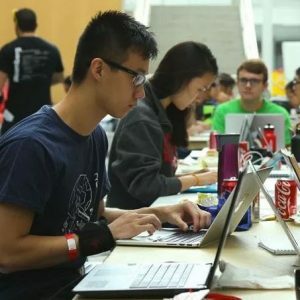 Can’t make the clinic or write-in? Help is still available! Make an appointment with a librarian or a writing tutor.